Sir Cosmo Duff Gordon (22 July 1862 – 20 April 1931) was a prominent Scottish landowner and athlete who is today best known as a survivor of the sinking of the RMS Titanic in the North Atlantic Sea on April 15, 1912. A keen fencer, Duff Gordon was also a member of the Bath Club, a London Club that featured an indoor swimming pool (a great novelty in the late 1800s) and counted many athletes among its members. He may well have witnessed Bartitsu founder E.W. Barton-Wright’s demonstration at the Club in 1899. Duff Gordon’s colleague William Grenfell, the first Baron Desborough, was at that time the president of the Bath Club and likewise went on to become associated with Bartitsu, accepting the presidency of the Bartitsu Club. Both Duff Gordon and Grenfell were members of the organising committee of the 1908 London Olympic Games. 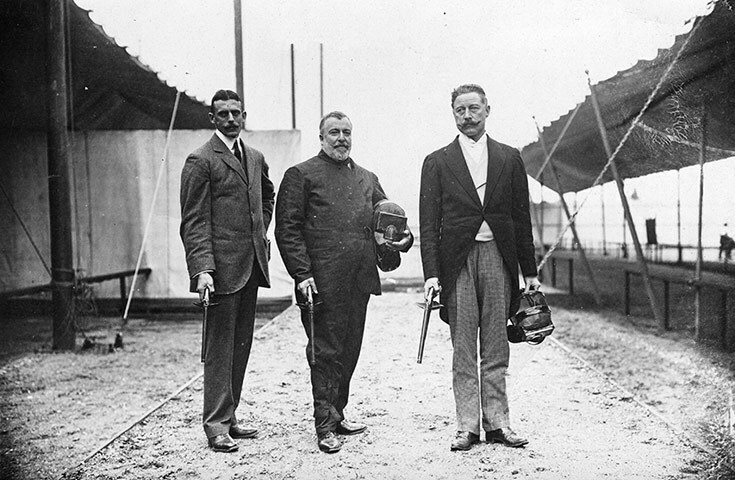 Sir Cosmo Duff Gordon (left) poses with W. Bean and Captain MacDonnell, all three holding duelling pistols and protective masks.In 1912, Cosmo Duff Gordon and his wife, the famous fashion designer Lucy Christiana, Lady Duff Gordon, became embroiled in a massive scandal surrounding the circumstances of their surviving the wreck of the Titanic. It was popularly alleged that the wealthy Duff Gordon had bribed members of the crew of their lifeboat not to return to help people left swimming for their lives as the ship sank. He was fully cleared of these charges after an exhaustive inquiry, but, sadly, the stigma of the scandal ruined his reputation and he spent much of the rest of his life shunning the public eye. A recently discovered cache of letters by Cosmo and Lucy Duff Gordon offers a poignant perspective on one of the great tragedies of the early 20th century. ‹ PreviousJoin the aristocracy – become a Scottish Laird, Lord or Lady!